Media are reporting more and more on the suzuki fruit fly in recent years. This fruit fly originates from Asia, but now Europe is affected by it as well. In 2011, it was first seen in Belgium, in Ostend. In 2012 and 2013, the variety was also found in various places in the Netherlands. The harmful suzuki fruit fly was able to stay active over the past months because of the mild winter, Natuurbericht reports. Biologists had been hoping for a severe winter. The fruit sector is concerned about the advance of the fruit fly, capable of destroying more than 80 percent of the harvest. Cherries, berries, raspberries, blackberries and strawberries are particularly attractive to the Asian suzuki. Another threat is the Little Cherry Virus. The Little Cherry Virus is the fear of every cherry grower. This virus has been spreading in recent years, and is slowly extending its reach. The problem mainly applies to standard tree plantings. Through insects and wind, it can be passed on to other young plantings nearby. The virus infects trees, preventing cherries from ripening, and causing them to stay small. Fruit growers are making every effort to combat the virus and the fruit fly. The suzuki fruit fly doesn't have much impact on top fruit. In any case, it hasn't been proven yet. A top fruit grower and exporter: "This fruit fly focuses more on soft fruit. Last season, the suzuki fruit fly was mainly found in soft fruit like cherries, blackberries and raspberries. There was concern about it having a negative impact on the top fruit hanging on the trees since last year. The fruit flies would reportedly be more attracted to that, but I think it wasn't quite so bad." Late last year, grower Theo Douven also reported having been affected by the suzuki fruit fly. "2014 was a very unusual year," he said. "July was unusually hot, August unusually wet, and toward the end of September we were hit by the suzuki fruit fly. It was difficult. We had been warned, but when it does come, it's a lot of work. You have to do things you've never done before, including spraying more. It can be dealt with, but you have to learn to do that." Cherry growers are facing two threats this season. Combating the suzuki fruit fly and the Little Cherry Virus. 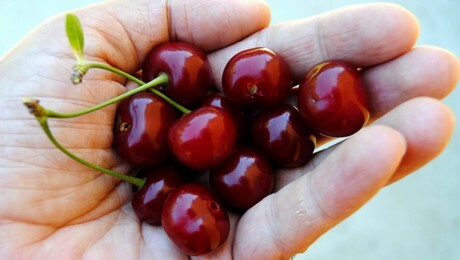 Still, we shouldn't be too pessimistic, thinks cherry grower Bert Vanweddingen of Cherryfarm. "If growers protect themselves properly against this fly and the virus, the damage can certainly be limited." He is working on placing a canopy in his orchard that the fruit fly can't penetrate. "I personally haven't been affected by the suzuki fruit fly, because we were done picking relatively early last year. Last year, part of the growers were affected by the rainfall, causing cherries with damage to remain. The suzuki fruit fly was attracted by those, which will also be noticeable in the harvest this year." In other countries, like Canada, the government is doing more against the Little Cherry Virus, he says. "They have special legislation there, with the government searching for outbreaks of the virus, removing them or having them removed by the grower. We aren't that advanced here. It's everyone for themselves. It's really spreading unchecked. You could do everything in your power as a grower, but if the grower next door does nothing, you'll also be affected." Bert Vanweddingen knows that these threats could lead to a smaller harvest. "The difficulty is that the suzuki fruit fly is only attracted by the harvest a few days before picking, so you're not allowed to spray anymore. So it's a matter of taking very good precautions, and following instructions. It's important for us to remain optimistic, making sure we, as growers, are well prepared. Now we have to wait, and not much can be said yet, since the harvest is still three months away."